This Heckler and Koch G36C airsoft gun can go between semi and fully automatic with the flip of a switch. The powerful motor allows this electric AEG gun to fire at a very high rate of speed for guns in its class. The foldable stock and adjustable hop-up allow for ease of use and quick reloading. The gun contains an adjustable rear sight for aiming and tactical railing. The 300-shot capacity will allow you to shoot for a long time between reloads at a velocity of 300 fps. 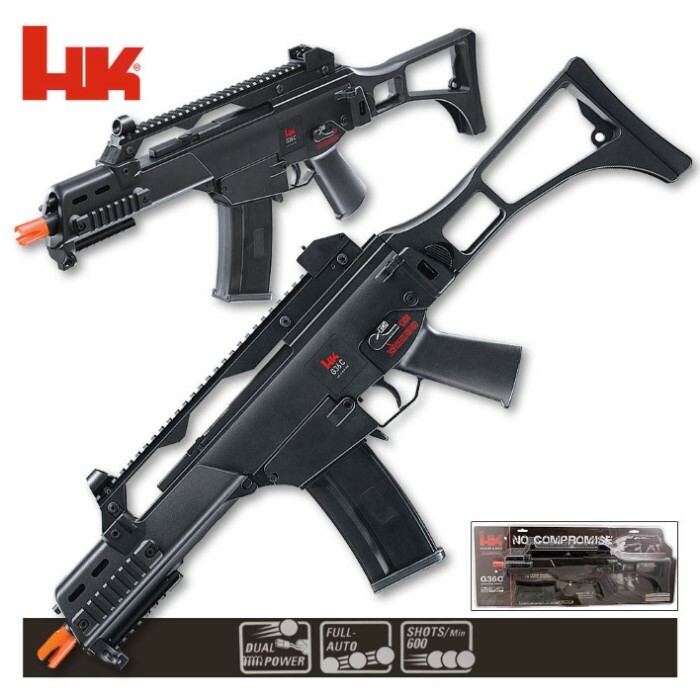 This airsoft gun is powered by an 8.4 volt NiMH battery and includes a battery and charger. 28 in. overall. This gun is great! I have had it for a while now and the performance has not change a bit from the day I got it. I love how if the battery runs out you can shoot is with a spring. It s an all around gun you can shoot it far away or up close. If you are looking for a gun with great performance get this gun. It also has 4 rails so you can customize this gun to your liking. This gun is simply amazing there is nothing not to like about it this gun shoots extremely far and is extremely accurate you can adjust the hop up on the gun for greater accuracy but i would not suggest buying any bbs over .20 grams because then you lose rang accuracy but the tend to stay closer to the center of the iron sights when fired at long ranges but you do lose range with heavy bbs so i would suggest .12 because they do increase range but do lose some accuracy this gun is simply amazing even tho i was slightly upset about the size of the battery because all you can hold is a small stick battery but if you want a bigger battery you need a external battery holder but for only $89.99 this gun is way worth it it a very high end gun for a very low price all considered worth buying it.